The official said that Washington oversees the opening of trade with New Delhi as a key strategic objective for the Trump administration. Washington: Principal Deputy Assistant Secretary for South and Central Asian Affairs, Alice Wells, has said that the upcoming India-US 2+2 dialogue would serve as an important opportunity to enhance the relations between the two countries, while adding that deliberations on operationalising India as a major defence partner would be held in the meeting. After getting deferred twice, the first India-US 2+2 dialogue is scheduled to take place in New Delhi on September 6. Notably, the high-level meeting will take place between External Affairs Minister Sushma Swaraj and Defence Minister Nirmala Sitharaman with their American counterparts US Secretary of State Michael Pompeo and Secretary of Defence James Mattis. Addressing a press briefing here, Wells said, "With India, we are looking forward to the inaugural 2+2 dialogue where Pompeo and Mattis would be travelling to Delhi. This is an important opportunity to enhance and discuss our engagement in a range of diplomatic and security priorities and is an indication of the deepening strategic partnership that we enjoy with India. In the 2+2 dialogue, we will discuss how do we operationalise India as a status as a major defence partner." The 2+2 meeting would cover a broad range of bilateral, regional and global issues of shared interest, with a view to strengthening security ties between the two nations. Wells underscored that India plays a central role in the US national security, adding that it is enshrined in US President Donald Trump's national security strategy. She continued, "Our partnership is rooted in values and we share democratic values and commitment to rule-based order. We have gone from zero dollars in defence cooperation in 2008 to 18 million dollars today." The American diplomat stressed that Washington conducted military exercises with New Delhi than with any other country in the world. She said, "How do we take this partnership to a new level, and so it's not going to be based on defence acquisitions, but framing how we see these challenges and how we are able to respond to these challenges." 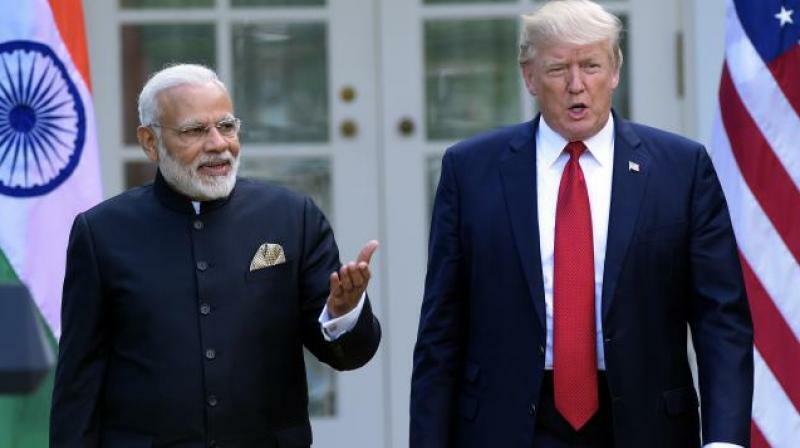 Commenting on the close Indo-US cooperation, Wells elucidated that Washington oversees the opening of trade with New Delhi as a key strategic objective for the Trump administration. Wells informed that the bilateral trade between the two countries at present is USD 126 billion dollars; USD 10 billion more from last year. She credited the rise in the bilateral trade to critical purchases by Indian firms in commercial aviation, energy and defence sectors. Acknowledging that there were impediments in the bilateral ties, Wells explained, "Tariffs and non-tariffs barriers and intellectual property rights have been the subjects of long-term concerns. We are continuing intensive dialogue with the Indian government on how to address these irritants and unlock the trade that is of great interest to the US firms when they look at the Indian market and its potential." The 55-year-old American diplomat underlined that Washington is willing to work with New Delhi in several projects outside India. Terming India as an 'all-weather partner', Wells further said, "One of the great new elements of our relationship is working in third countries. We worked together in Africa at assistance level in health issue, peacekeeping training; and on programs like bringing Afghan people to India for training that can be done at lower costs and with greater effectiveness."